Breaking boundaries and crossing genres with their take on all things musical, Melbourne based trio 1200 Techniques had carved themselves a unique spot on the Australian hip hop scene ever since their first single, “Hard As Hell”, made its debut back in 1998. 1200 Techniques’ influences did stretch across the globe, including the likes of Africa Bambataa, Grand Master Flash and The Furious Five, Public Enemy, Funkadelic, Sly Stone, Prince, Jimi Hendrix, Black Sabbath, Thin Lizzy, Beastie Boys, Run DMC, Rage Against The Machine and many more. The trio began collaborating together back in 1997, after Peril (a mainstay on the hip-hop scene since his early days as a graffiti artist) spotted Nfamas’ brother, Kabba, on stage in a Melbourne pub. The brothers had been busy writing and recording rhymes since they were a mere 10 years old, dabbling in everything from world music to drum’n’bass. Peril, meanwhile, hadn’t considered teaming up with his own brother, who at that stage was busy writing his own songs with his band Quarter2Nine. Soon enough, the four players joined forces, and when Kemstar came up for the riff to “Hard As Hell”, the future was decided. Signing to Rubber Records not long after, 1200 Techniques began work on what would become their debut album. Midway though recording, however, Kabba chose to relocate to the UK (but you can still hear him on several tracks.) Choose One was released June 2002 on Rubber, with distribution through Sony Music, and became an instant radio hit. Energetic, vibrant and packed with dancefloor anthems like “Electro Boogie” and “Battle Master”, the group’s lead single, “Karma”, took out the 2002 ARIA Award for Best Video, its creators the team behind Moulin Rouge. Choose One also took out Best Independent Release. With national spots on festivals such as the Big Day Out, Homebake and loads of their own headline shows under their belt, 1200 Techniques have become renowned across the country as a electrifying live act that’s hard to beat or define. “We haven’t got a basic ingredient, it can change each time,” says Kemstar. 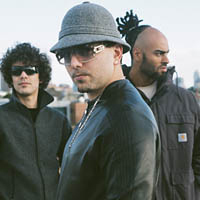 With yet another national tour taking mid 2003 (named after the band’s latest single, “Eye Of The Storm”), 1200 Techniques did then release album number two, “Consistency Theory” , in October of 2004. Mixed by New York-based Troy Hightower (LL Cool J, De La Soul, Lil’ Kim), the album achieved significant success paving the way for greater acceptance of Australian Hip Hop styles. Having thereafter capping off the release via an appearance on the national Big Day Out Festivals, 1200 Techniques have remained in hiatus. A new album is looking likely in 2012. Stay tuned.